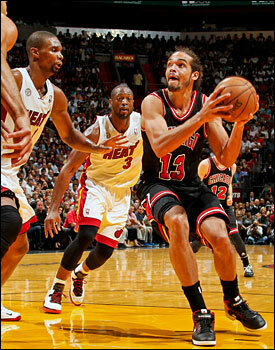 It’s the Bulls playing the Miami Heat Thursday at the United Center on national TNT, and the Bulls know what’s coming. Heck, they knew it a few minutes after beating the Heat last month in Miami. Just like the final regular season game between the teams in the 2011-12 season after the Bulls had won two of the first three. That was when Dwyane Wade threw Richard Hamilton into the stands and “cheap” was being used other that for the material in Spoelstra’s suits. This doesn’t happen much in the regular season in the NBA these days, if not an actual rivalry, which is rare, but this is a game with a lot more passion and purpose. You get the opponents’ best game when you are the champion, as the Bulls well know from the 1990s. The Heat isn’t quite as dominant as those Bulls, though Miami is starting to pull away in the Eastern Conference now with eight straight wins after Tuesday’s victory in Atlanta and a five game lead over second place New York, seven over the Bulls. So perhaps the Heat more view the Thunder or Spurs or Clippers or even Lakers as the obstacle to get through to repeat as NBA champions. Though there’s this pesky particle from Chicago that not only believes it can defeat Miami, but over the last three years since LeBron James arrived maintains a winning record over the Heat. The Bulls, including the five-game playoff loss in 2011, are 7-6 against Miami with a heck of a lot of memorable moments, and perhaps more than any team in the league with the personnel as well as the formula to challenge Miami. I’m hardly suggesting the Bulls are better than the Heat because you have to beat them when it matters to demonstrate that. The Bulls didn’t when they had the chance after taking that 1-0 conference finals lead in 2011. But this Bulls team, and certainly last year’s when I did believe the Bulls were better because of Derrick Rose and the depth that included four big men with Omer Asik, is quietly confident. That possible edge from season has changed, obviously, especially with Rose out all season after knee surgery last May. But this Bulls team, its core together since the Heat incorporated in the summer of 2010, believes even without Rose it can defeat Miami. Though only because the Bulls have done so. Thursday Night Basketball isn’t quite the phenomenon of Monday Night Football, though there is much in common. If you could excuse Charles, Kenny, Ernie and Shaq instead of the country/western singer with the belt she uses as a dress. But like with Monday Night Football, the NBA watches Thursday night, which is the one night all week the league blacks out basically all other games. It’s sports bars for the NBA as everyone pretty much gathers around TNT as they await their Friday games. No Big Bang Theory and Parks and Recreation for the NBA. And there’s been something to these Bulls/Heat games, if not a full blown Bulls/Pistons rivalry quite yet. The absence of true rivalries is one of the disappointments that expansion has brought to the NBA. At most you play a team four times, often three if they are not in your division. And invariably in one game some star is out. Plus, we know, rivalries are created with playoff battles. 2011-12: Rose would miss two of the four games with various injuries before his serious knee tear, and in another, a Bulls win, Rose would have perhaps the poorest game of his career shooting one of 13 for two points and replaced by C.J. Watson. Watson would lead the Bulls to victory in that one with a clutch three to send the game to overtime in the United Center. The Bulls won the other game in Chicago with John Lucas scoring 24 points, this after James had literally leaped over Lucas to dunk in Miami’s win in the first game. Trailing 2-1 and having lost five of six regulars season games to the Bulls, the Heat gooned it up in the finale and outrebounded the Bulls for the only time in seven regular season games. 2012-13: Carlos Boozer had a big 27 points and 12 rebounds and Noah matched that with a dozen rebounds as well as the Bulls pushed around Miami’s small ball championship formula with Chris Bosh at center for a 48-28 smackdown on the boards, 20-7 in second chance points and 19-4 on the offensive boards. You sensed, though, Miami still wanted no part of the Bulls and that front line which Joel Anthony hadn’t quite silenced yet. In James, Miami has the game’s best player, and Wade isn’t quite done yet. Ray Allen was a big addition. They’re overwhelming on the break, and the Bulls have been sloppy with the ball in recent games. But the Bulls are third in field goal defense and the Heat is ninth. The Bulls are third in defending the three. Miami is tied for 18th, suggesting if you move the ball and don’t settle for early offensive options they’ll tire chasing you. The Bulls are fifth in rebounding; Miami is 30th. So the Bulls believe they have the necessities to defeat Miami even without Rose. Which is why there’s been so much hope about Rose playing. After all, if the Bulls can beat Miami without Rose, well, even a Rose playing 20 minutes could lead to something big. Deng can play James. No one can stop James, but with Deng you don’t need everyone watching and helping on James, whose passing opens up Miami’s offense for easy shots. Kirk Hinrich always has frustrated Wade, though Richard Hamilton has been playing him along with Marco Belinelli and Jimmy Butler, the latter with big plays down the stretch in last months’ game and a 33-14 Chicago bench edge. Butler can also take some time on James. The Bulls’ offense is generally patient, which is most effective against Miami. You want them to play defense for 20 seconds, which also limits their fast break and gives you time to set your defense. And then you want to crash the boards on them as they’d prefer to play small and athletic. The Bulls don’t. Right after the Heat beat Atlanta Tuesday night, Shane Battier did a courtside interview and the Bulls clearly were on his mind. If not in their heads, the Heat has the Bulls on its minds. Which is a start. Getting a chance to measure yourself against them is one of the joys of basketball in February.